The Sharks rode their superior depth, potent power play and stellar goaltending from Martin Jones to the second sweep in franchise history, knocking out the Ducks with a 2-1 victory on Wednesday night. SAN JOSE, Calif. — Very little separated San Jose and Anaheim in the regular season, with the Ducks edging out the Sharks by one point for second place in the Pacific Division. Their first-round series wasn't nearly as competitive. "We're playing well going into the second round," defenceman Marc-Edouard Vlasic said. "Everybody is contributing if it's offensively, blocking shots, taking a hit. Everybody is doing what they have to for us to win." After jumping on Anaheim early to win the first two games on the road, the Sharks earned a lopsided win in Game 3 thanks to undisciplined play by the Ducks and then withstood a strong push to end the series in Game 4. Jones kept Anaheim at bay for long stretches in the second and third period before finally allowing a tying goal to Andrew Cogliano. San Jose then took 1:16 to answer and scored the eventual series-clincher when Vlasic's point shot deflected off Tomas Hertl and into the net. "The response goal was huge," coach Peter DeBoer said. "We were on our heels. They were pressing. It's tough to play an elimination game when you get an opportunity to sweep a really good team like that." 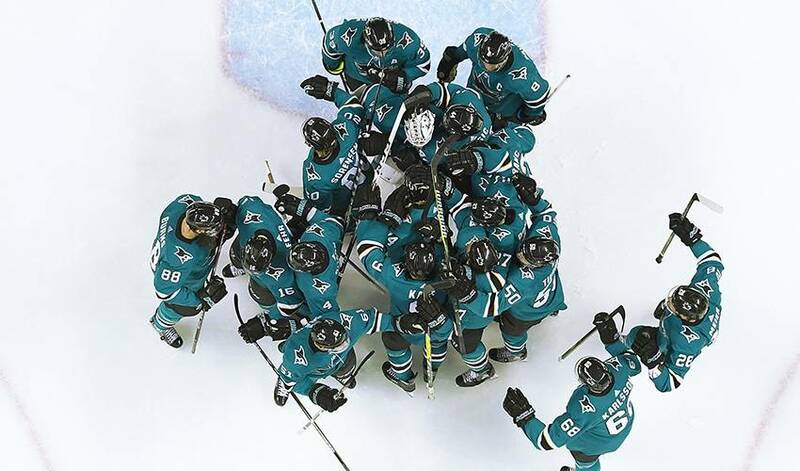 The Sharks were in control for most of the series, outscoring the Ducks 16-4 in their most lopsided series in franchise history, according to the Elias Sports Bureau. San Jose got as many goals from its fourth line in the series as Anaheim had from its entire team with Marcus Sorensen scoring his third of the series to give the Sharks a 1-0 lead in the first period of the clincher. Eric Fehr also had a goal from the fourth line in the series. "Every night they hopped over the boards with energy and grabbed momentum for us, drew penalties," DeBoer said. "They were fantastic, but I've said from Day 1 we need to be a four-line team if we're going to have success. And I think the teams that are moving through are. I watched Vegas a little bit last night. They're a four-line team." The expansion Golden Knights are also the next team in the Sharks' way. The two will meet in the second round starting sometime next week in just the second series in the past 22 years featuring teams coming off sweeps in the previous round. Vegas finished off the Los Angeles Kings on Tuesday night, part of a record-setting inaugural campaign that included a Pacific Division title in the regular season. The Sharks will likely need another strong defensive effort next round led by Jones. He was brilliant in the clincher, making several tough saves against Corey Perry. He also had a shutout in Game 1 and set a San Jose playoff record with 45 regulation saves in Game 3. He finished the series with a .970 save percentage, helping the Sharks earn their second sweep in franchise history after also doing it in the first round against Vancouver in 2013. "Goaltending wins this time of the year," forward Logan Couture said. "He was fantastic. He made a lot of Grade A saves. He was our best penalty killer. They had some really good looks. Perry had a lot of chances that Joner made some big saves on." By extending their season another round, the Sharks may be able to get star centre Joe Thornton back in the lineup. Thornton has been out since injuring his right knee on Jan. 23. He has resumed skating and took part in warmups throughout the series but has said he doesn't want to return until he knows he's healthy enough to help the team and make it through what he hopes will be a run to the Stanley Cup Final. The Sharks have time now to figure that out. "That's all hypothetical," DeBoer said. "That doesn't even cross our desk. Those decisions will be something if he is healthy we'll make then. Sometimes those things sort themselves out. I'm just really proud of our group, the resiliency, the composure."